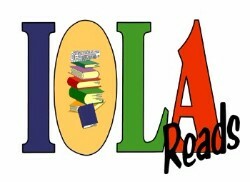 Visit the Iola Public Library for more information on the programs affiliated with Iola Reads. Two book selections are offered each year. For more information, visit the Iola Public Library website at http://iola.mykansaslibrary.org/. Iola Reads book selections may be picked up for a small donation at the Iola Public Library, at any USD #257 school library or at one of the many supporting businesses around town.